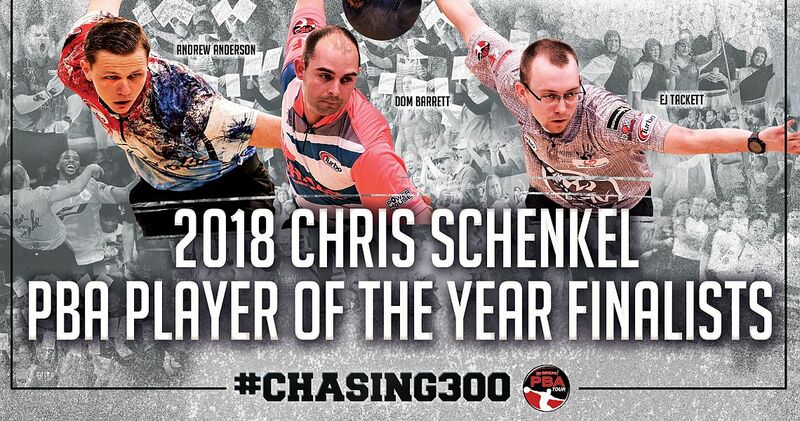 The selection of the 2018 Chris Schenkel PBA Player of the Year is down to three finalists – Andrew Anderson of Holly, Mich.; Dom Barrett of England and EJ Tackett of Bluffton, Ind. – and the winner will be announced by PBA CEO and Commissioner Tom Clark in a special live FloBowling presentation on Tuesday at 11 a.m. EST. The announcement will be live-streamed on FloBowling.com and streamed simultaneously on FloBowling’s Facebook page, Twitter page and YouTube channel. Voting among PBA members and veteran bowling writers across America is complete. Among the Player of the Year candidates who qualified by finishing among the top 10 in either PBA earnings or competition points, Anderson, Barrett and Tackett are the three leading vote-getters, in alphabetical order. Among the three, Tackett is the only previous Player of the Year winner, capturing the honor for the 2016 season. Andrew Anderson, 23, won his first two Go Bowling! PBA Tour titles in 2018 including his first major, the USBC Masters. The second-year PBA member also won the 2018 Harry Smith Points Leader Award, symbolic of the tour’s most consistent player. He also finished third in the PBA Tournament of Champions, and ranked among the top five in earnings and scoring average. Dom Barrett, 33, won the 2018 U.S. Open for his second career major and also won the DHC PBA Japan Invitational. He had top 10 finishes in all three key statistical categories: points (10th), average (seventh) and earnings (second). EJ Tackett, 26, was the PBA Tour’s only three-title winner in 2018 and had two other top-five finishes, including fourth place in the U.S. Open. He ranked among the tour leaders in competition points (third), earnings (fifth) and average (sixth). Tuesday’s announcements also will include the 2018 Harry Golden PBA Rookie of the Year, Steve Nagy Sportsmanship Award winner and PBA Tony Reyes Memorial Community Service Award recipient. The top three contenders for the 2018 PBA Rookie of the Year award are Thailand’s Annop Arromsaranon; Kamron Doyle of Brentwood, Tenn., and Malaysia’s Rafiq Ismail. Annop Arromsaranon, 34, was the only rookie to win a title, capturing the PBA International-World Bowling Tour Busan Cup in South Korea. Kamron Doyle, 20, led all rookies with seven cashes in 15 PBA Tour events, with a best finish of third in the PBA Xtra Frame Gene Carter’s Pro Shop Classic. He also finished in a tie for 12th place in the USBC Masters. Rafiq Ismail, a 21-year-old lefthander, cashed in three of the four PBA Tour events he entered and led all rookies with a 220.84 average in his limited action. The POY and ROY winners will be presented their awards during the PBA Clash that will be televised by FOX on Sunday, Dec. 23. The Nagy and Reyes award winners will be recognized during the PBA Hall of Fame induction ceremonies that will be live-streamed by FloBowling on Jan. 5 from Arlington, Texas.